The interconnection of the Eastern and Western hemispheres made possible by transoceanic voyaging marked a key transformation of this period. Technological innovations helped to make transoceanic connections possible. Changing patterns of long-distance trade included the global circulation of some commodities and the formation of new regional markets and financial centers. Increased interregional and global trade networks facilitated the spread of religion and other elements of culture as well as the migration of large numbers of people. Germs carried to the Americas ravaged the indigenous peoples, while the global exchange of crops and animals altered agriculture, diets, and populations around the planet. I. 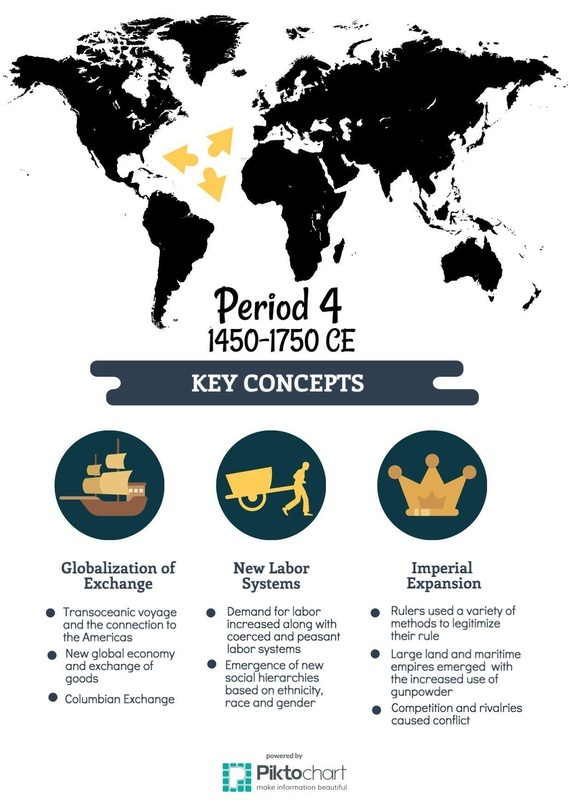 In the context of the new global circulation of goods, there was an intensification of all existing regional trade networks that brought prosperity and economic disruption to the merchants and governments in the trading regions of the Indian Ocean, Mediterranean, Sahara, and overland Eurasia. III. Remarkable new transoceanic maritime reconnaissance occurred in this period. A. Portuguese development of maritime technology and navigational skills led to increased travel to and trade with West Africa and resulted in the construction of a global trading-post empire. B. Spanish sponsorship of the first Columbian and subsequent voyages across the Atlantic and Pacific dramatically increased European interest in transoceanic travel and trade. C. Northern Atlantic crossings for fishing and settlements continued and spurred European searches for multiple routes to Asia. D. Official Chinese maritime activity expanded into the Indian Ocean region with the naval voyages led by Ming Admiral Zheng He, which enhanced Chinese prestige. IV. The new global circulation of goods was facilitated by royal-chartered European monopoly companies that took silver from Spanish colonies in the Americas to purchase Asian goods for the Atlantic markets. Regional markets continued to flourish in Afro-Eurasia by using established commercial practices and new transoceanic shipping services developed by European merchants. B. Commercialization and the creation of a global economy were intimately connected to new global circulation of silver from the Americas. C. Influenced by mercantilism, joint-stock companies were new methods used by European rulers to control their domestic and colonial economies and by European merchants to compete against one another in global trade. D. The Atlantic system involved the movement of goods, wealth, and free and unfree laborers, and the mixing of African, American, and European cultures and peoples. A. European colonization of the Americas led to the spread of diseases — including smallpox, measles, and influenza — that were endemic in the Eastern Hemisphere among Amerindian populations and the unintentional transfer of vermin, including mosquitoes and rats. VI. The increase in interactions between newly connected hemispheres and intensification of connections within hemispheres expanded the spread and reform of existing religions and created syncretic belief systems and practices. The continuing importance of Sufi practices contributed to the further spread of Islam in Afro-Eurasia as believers adapted Islam to local cultural practices. The political rivalry between the Ottomans and Safavids intensified the split between Sunni and Shi’a. The practice of Christianity continued to spread throughout the world and was increasingly diversified by the process of diffusion and the Reformation. Vodun developed in the Caribbean in the context of interactions between Christianity and African religions. Sikhism developed in South Asia in the context of interactions between Hinduism and Islam. While the practice of Buddhism declined in South Asia and island Southeast Asia, different sects of Buddhism and Buddhist practices spread in Northeast Asia and mainland Southeast Asia. VII. As merchants’ profits increased and governments collected more taxes, funding for the visual and performing arts, even for popular audiences, increased along with an expansion of literacy. Although the world’s productive systems continued to be heavily centered on agricultural production throughout this period, major changes occurred in agricultural labor, the systems and locations of manufacturing, gender and social structures, and environmental processes. Adapting to the Little Ice Age, farmers increased agricultural productivity by introducing new crops and using new methods in crop-and-field rotation. Economic growth also depended on new forms of manufacturing and new commercial patterns, especially in long-distance trade. Political and economic centers within regions shifted, and merchants’ social status tended to rise in various states. Demographic growth — even in areas such as the Americas, where disease had ravaged the population — was restored by the late eighteenth century and surged in many regions, especially with the introduction of American food crops throughout the Eastern Hemisphere. The Columbian Exchange led to new ways of humans interacting with their environments. New forms of coerced and semi-coerced labor emerged in Europe, Africa, and the Americas, and affected ethnic and racial classifications and gender roles. B. Slavery in Africa continued both the traditional incorporation of slaves into households and the export of slaves to the Mediterranean and the Indian Ocean. III. As social and political elites changed, they also restructured new ethnic, racial, and gender hierarchies. A. Both imperial conquests and widening global economic opportunities contributed to the formation of new political and economic elites. (Ex: Manchus in China, Creole elite in Spanish America, European gentry, urban commercial entrepreneurs in all major port cities in the world). B. The power of existing political and economic elites fluctuated as they confronted new challenges to their ability to affect the policies of the increasingly powerful monarchs and leaders. (Ex of existing elites: zamindars in the Mughal Empire, nobility in Europe, daimyo in Japan). Empires expanded and conquered peoples around the world, but they often had difficulties incorporating culturally, ethnically, and religiously diverse subjects, and administrating widely dispersed territories. Agents of the European powers moved into existing trade networks around the world. In Africa and the greater Indian Ocean, nascent European empires consisted mainly of interconnected trading posts and enclaves. In the Americas, European empires moved more quickly to settlement and territorial control, responding to local demographic and commercial conditions. Moreover, the creation of European empires in the Americas quickly fostered a new Atlantic exchange network that included the trans-Atlantic slave trade and trans-Pacific exchange network. Around the world, empires and states of varying sizes pursued strategies of centralization, including more efficient taxation systems that placed strains on peasant producers, sometimes prompting local rebellions. Rulers used public displays of art and architecture to legitimize state power. African states shared certain characteristics with larger Eurasian empires. Changes in African and global trading patterns strengthened some Western and Central African states — especially on the coast; this led to the rise of new states and contributed to the decline of states on both the coast and in the interior. D. Rulers used tribute collection and tax farming to generate revenue for territorial expansion. B. Land empires, including the Manchu, Mughal, Ottoman, and Russian—expanded dramatically in size. C. European states established new maritime empires in the Americas, including the Portuguese, Spanish, Dutch, French, and British. III. Competition over trade routes, state rivalries, and local resistance all provided significant challenges to state consolidation and expansion. (Ex: of competition over trade routes: Omani-European rivalry in the Indian Ocean, piracy in the Caribbean; ex of state rivalries: Thirty Years War, Ottoman-Safavid conflict; local resistance examples: food riots, samurai revolts, peasant uprisings).